Chocolate and peanut butter, peanut butter and jelly, peanut butter and fluff…classic, time tested flavor combinations that will never fall out of favor. However, none of these come close to the creamy chocolate-hazelnut combination of Nutella. This genius (in my opinion) concoction was invented in the 1940s by Pietro Ferrero in Italy when he was forced to stretch the rationed supply of chocolate with chopped hazelnuts. (This is reminiscent of how red velvet cake came to be- bakers would add beet juice to cake to give it a darker color when chocolate supplies were scarce.) It was initially called “Pasta Gianduja” and then renamed “Nutella” in 1964. Since then, it has gained mass popularity in the US and around the world. There is even a “National Nutella Day” on February 5th! And Nutella was recently in the news when thieves in Germany stole 5 tons of it earlier this month. My introduction to Nutella was in the form of crepes, filled with nutella and bananas or strawberries. However, in the past several years I have experimented with Nutella ice cream, Nutella quesadillas (2 flour tortillas with nutella and marshmallows in between, heated in a skillet until tortillas are lightly browned on both sides and marshmallows are melted), and more recently Nutella cupcakes (pictured below, recipe at www.baked-in.com). 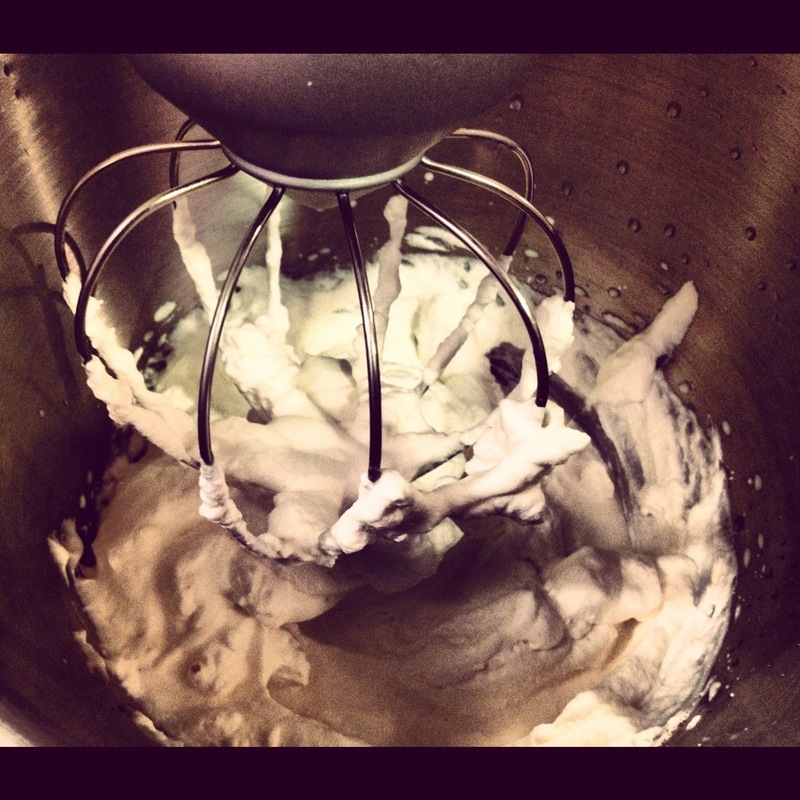 Disclaimer #1: This frosting recipe makes more than what is needed for the cake and I cannot be responsible for what is done with the leftovers (there might be a Nutella frosting food coma involved)! Disclaimer #2: Despite some recent commercials touting Nutella as the key to a nutritious and healthy breakfast, Nutella unfortunately, is not a healthy chocolate spread. Apparently there’s actually a lawsuit surrounding this issue…but seriously, chocolate, hazelnut, palm oil- did someone really think this could be good for you? Gorgeous beach- never seen water so blue! I’m back from vacation and back to baking! My friend, Julia, and I just took a little vacation to Miami and Bimini. While we enjoyed Miami and had some great food there (at Versaille, the Bazaar, Yardbird, and Puetro Sagua), we really fell in love with Bimini. Bimini is a small island chain of the Bahamas, about 50 miles from Miami, with a population of about 1600. Bimini was at one point home to Ernest Hemmingway and currently contains the world famous shark lab. We stayed at a little bed and breakfast owned, by Doug, a US citizen who has lived in Bimini for the past 25 years and is friends with all the local Bahamians. Doug was our tour guide, boat captain and chef. He took us out snorkeling and taught us how to free dive for conch. He made delicious meals of freshly caught lobster, hog fish and conch (including conch chowder and cracked conch). However, one of our favorite things that he introduced us to was Bimini bread and coconut rolls. Bimini bread looks like regular white bread but is much sweeter and has a slightly denser texture- perfect for toasting with butter or making french toast. We bought our Bimini bread from Nathle Thompson who, now in her 70s, has been making the bread for decades, making 96 loafs a day. She also makes delicious little coconut rolls. These little rolls are made out of a sweet yeast bread similar to Bimini bread and are stuffed with freshly grated coconut and sugar. With the sweet bread, it reminded me a little bit of a coconut filled brioche roll. And from this, inspiration hit, and I decided to experiment with Flour’s brioche dough recipe and a coconut filling. The result was a sweet, but softer version of Bimini’s coconut rolls: layers of brioche folder over sweetened, creamy coconut. And with each bite, I could almost imagine myself back in the sweet paradise of Bimini, relaxing under the hot sun and listening to the soft, blue waves against the beach. Monday afternoon at 2:50PM , April 15th 2013, I sat hot and sweaty on a tiny charter plane in Bimini (a small island in the Bahamas), waiting impatiently for it to take off for Ft. Lauderdale where I had a connecting flight to Boston. I was anxious to return home after 10 days away. Little did I know of the horror and tragedy taking place on the ground that moment in my home city. I landed to horrific footage and new reports of the events of the day, facebook and twitter were overflowing with marathon related posts and friends and family were texting me to make sure I was ok. I do not consider myself to be a very emotional person. My best friend will tell you that I never cried until I was 16 (although this isn’t actually true). Being a general surgery resident, I’ve built up a tough exterior to deal with the constant stress and sadness that we deal with on a daily basis. But when I heard about the marathon bombings and started reading stories about the injured and about the heroic acts that day, my heart broke and tears came to my eyes. As everyone has likely read by now, Marathon Monday is a special holiday in Boston; a day with over 20,000 runners and about 500,000 spectators. I saw my first Boston Marathon about 10 years ago when I went with my Tufts track team to heartbreak hill to cheer on runners. It’s hard to watch without becoming inspired. There are so many people running for a myriad of reasons: to raise awareness for cancer or MS, to honor a loved one, to overcome a personal struggle. The runners come in all shapes and sizes, they are old and young, some race in wheelchairs while others push their children in specially made wheelchairs. I got bit with the marathon bug in 2006 and joined the Tufts Marathon challenge, training for my first (and likely last) marathon. I developed a stress fracture about 6 weeks before the marathon. I was urged to stop training, let my leg heal and focus on recovery. But once you start training for a marathon, especially Boston, it’s hard to stop. Somehow, pushing through the pain I managed to finish, although very slowly. Crossing the finish line, with my parents cheering behind me, was a moment I will never forget. The next year I smartly deferred running for volunteering at the marathon and I would have been there this year, cheering strangers on had I not been on vacation. A recent article from “The Onion” poked fun at Boston for not being a real or legitimate city, people say we’re rude and call us “Massholes”, they make fun of our driving, our accents and confusing street layout. But I’ve never been more proud to be from Boston than on April 15th 2013. Our city came together in heroic ways and stories continue to flood the internet with acts of heroism, kindness and altruism. The bombings took place at 2:50 PM, the first injured victim arrived at Brigham and Women’s Hospital at 3:08PM and was in the OR around 3:30PM- if that doesn’t scream teamwork then I don’t know what does. This is a city with the top medical centers in the country, if not the world. We are a city of academia and innovation. We are the home to baked beans, Boston cream pie, clam chowdah, and fluffernutter. We eat more ice cream per capita than any other city (despite our freezing temperatures most of the year). We produced Aerosmith, Ben Affleck, Matt Damon, Mark Walhberg and more. Every year we put on the best 4th of July fireworks show in the country. We have the best sports teams…or at least the best sports fans! Whoever did this horrible act of hatred, picked the wrong city to mess with. We will and we are continuing to live our lives. 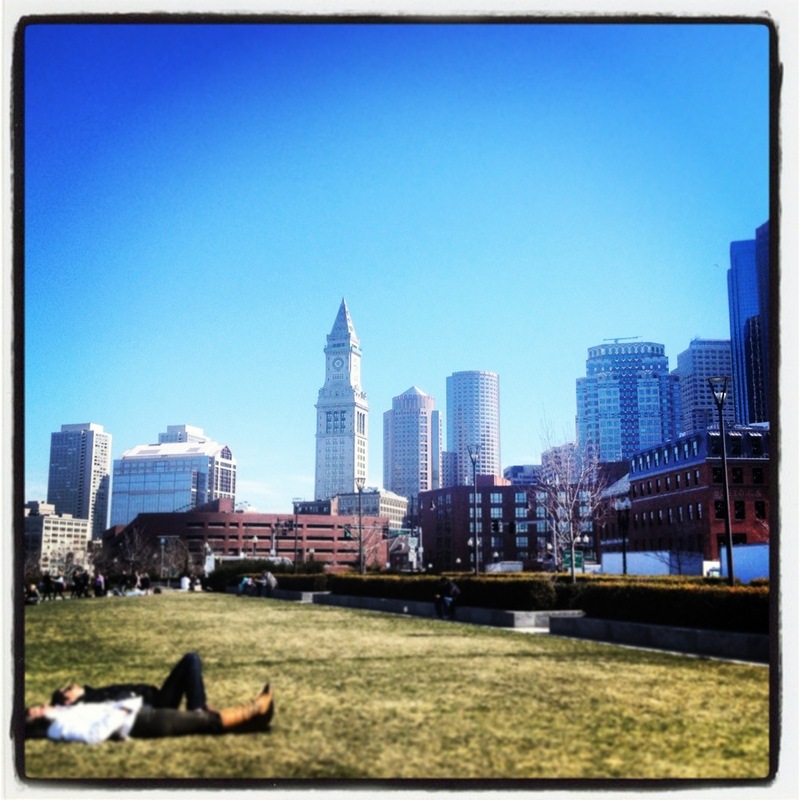 As I walked around Boston, on this gorgeous day today, I did not see a city paralyzed with fear. Instead, students and others were out enjoying the sun on the Boston Common, runners were running along the Charles, the T was busy and crowded as ever. Our streets and sidewalks may be damaged, store fronts broken, our citizens injured but our spirits are not broken. Stand strong Boston! It’s been a long winter here in Boston, marked by an especially ferocious Storm Nemo. Although I have lived in Massachusetts my whole entire life, I still hate the cold and haven’t even learned to ski! Luckily, we’ve been having little snippets of beautiful (aka 50-60 degrees) weather over the past 2 weeks…interspersed, of course, with bitterly cold days that have me running for my earmuffs and mittens. Hopefully, this means that spring is just around the corner, and with it delicious Spring desserts: lemon bars, mango and watermelon sorbet, raspberry tarts, etc. Until then, I’m heading south for some sun, vitamin D and warmer weather and will be taking a little hiatus from baking and cooking. See you soon Boston! Mini Cadbury cream egg hidden in the center! Just like a good little Jewish girl, I was really excited for Easter (did I mention that Easter this year fell during Passover?). I think the last time I had been this excited for Easter was when my Catholic ex-bf from college staged a real Easter egg hunt for me- my very first ever. This year, my enthusiasm was because I had come up with a brilliant idea for a cupcake (and who can pass up an opportunity to drink at 1PM at Easter brunch?). My vision was this: A yellow cupcake with a mini Cadbury cream egg hidden inside (that’s the Easter egg hunt part- get it? ), topped with a “nest” of chocolate ganache frosting and filled with pastel colored chocolate eggs. Overall, it was a pretty good cupcake but I’m still searching for the perfect yellow cupcake recipe. Most I have tried are too dry and I’d hate to resort to a boxed yellow cake mix (although I do admit they can be pretty tasty)…any suggestions?